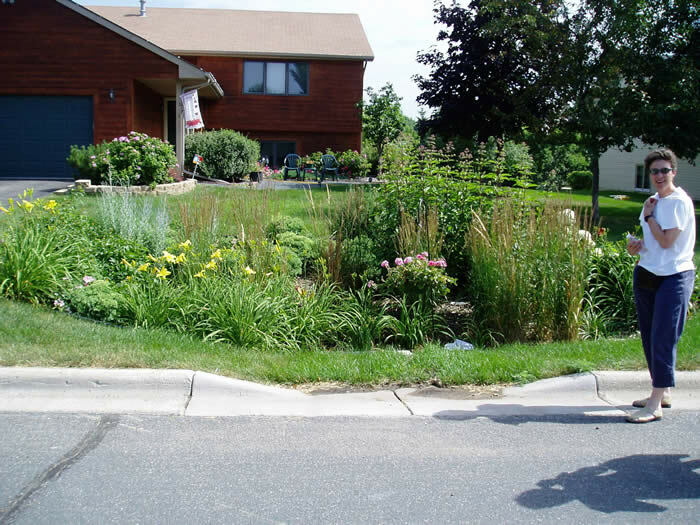 Tip: Plant a rain garden to catch stormwater runoff, spruce up your yard, and provide valuable habitat. (Learn more about this clean water tip). We have a wide variety of educational displays and exhibits available for (FREE) loan. Items can be checked out on request pending availability. MCWD volunteers or staff may also be able to attend your community festival or event -- contact us if you are interested or would like more information about any of the below displays. 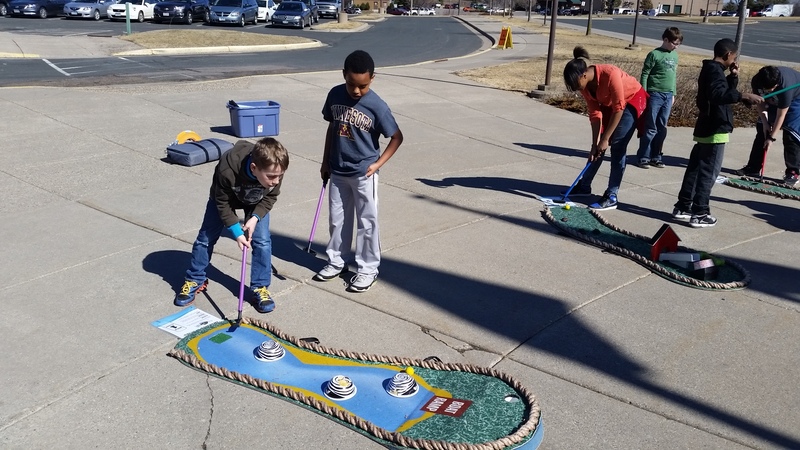 These 5 portable putt putt holes each address an activity that impacts water quality. Light plastic golf clubs, golf balls, and signage are also available. The largest hole is roughly 78" long and might not fit in every vehicle. Learn more about the Putt Putt. View a PDF of each sign. 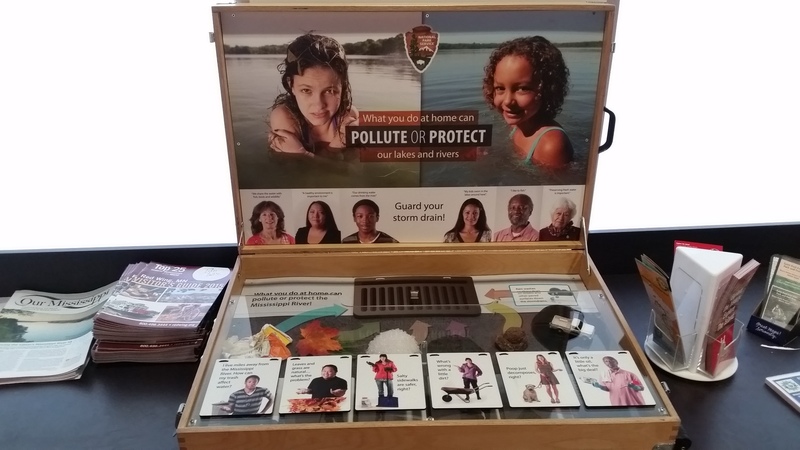 This interactive display allows users to look at actions that "pollute" our waters and compare them to those that "protect" our local lakes and streams. This 4'x2' foldable suitcase fits in most vehicles. Each bottle contains a different pollutant to visually demonstrate its effect on our waters. Bottles come in a small carrying case. This interactive "plinko" board demonstrates where water goes when it rains and how we can help slow it down or infiltrate it with different best management practices (BMP's). Each plinko chip represents a different pollutant. Supplemental table top board describes each pollutant and where it comes from. Movable "bumpers" can be added to represent BMP's and help direct water away from a stormdrain. In this interactive display, users can pull retractable cords ("roots") to see how long the roots of different plants are - and learn the benefits of native plants. The display is roughly 6' tall when set-up, and 2'x2' when collapsed for transportation. This kit for macroinvertebrate sampling contains various containers, ice cube trays, and spoons, plus ID charts, to help identify the macros captured. This kit for cleaning up stormdrains includes hand brooms, dust pans, reusable gloves and trash bags. Perfect for small group cleanups. This game for 5th-12th graders allows students to be "land use managers" and try to reduce pollution by investing in best management practices (BMPs). Several MCWD staff are "certified" for Watershed Game facilitation. Contact us for more information. This game designed for local leaders allows players to manage land use and reduce pollution by investing in best management practices (BMPs). Several MCWD staff are "certified" for Watershed Game facilitation. Contact us for more information. This banner describes the benefits of native plants, raingardens, and shoreline gardens. Banner is roughly 8 feet tall when expanded but collapses into a small case. 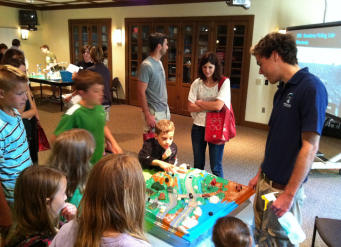 This interactive watershed model allows users to add "pollution" and then see what happens when it "rains" on the watershed. All materials included. Learn more about the Enviroscape.